Love is a life-and-death risk for the Mountain Mercenaries in New York Times bestselling author Susan Stoker’s explosive series of alpha heroes, hot action, and hard passion…Ever since his rescue op off the Pacific Coast, Mountain Mercenary Gray Rogers hasn’t been able to forget his latest “job”—Allye Martin. Any other woman would have panicked during a rescue, but the wily dancer kept her cool—even after being kidnapped by an elusive human trafficker. 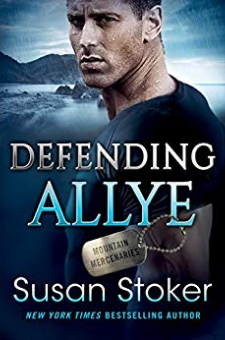 And Gray couldn’t be happier when a grateful Allye follows him home to Colorado Springs…For Allye, finding sanctuary in the arms—and bed—of the former Navy SEAL is only temporary. People are disappearing off the streets of San Francisco, victims of the same underground trade that targeted her, and Allye could be the key to dismantling the entire operation. She’s willing to do anything to bring them down. Gray isn’t—for good reason. But you don’t say no to a tough girl like Allye who refuses to play it safe.Now Gray is risking more than ever before. The Mountain Mercenaries have his back. But is it enough to keep the woman he loves out of harm’s way?